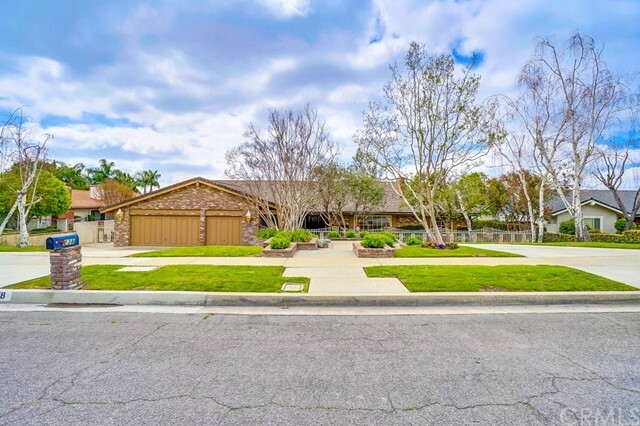 All Upland homes currently listed for sale in Upland as of 04/20/2019 are shown below. You can change the search criteria at any time by pressing the 'Change Search' button below. If you have any questions or you would like more information about any Upland homes for sale or other Upland real estate, please contact us and one of our knowledgeable Upland REALTORS® would be pleased to assist you. "Spectacular custom estate offering endless views of Southern California! Positioned in the foothills of San Antonio Heights at the top of a gated community, this exquisite and unique trophy property sits at the city's highest point providing ultimate privacy and unimpeded views all the way to Catalina Island. Stunning architecture with beautiful stone and iron work throughout, complete with high ceilings and gorgeous natural lighting. 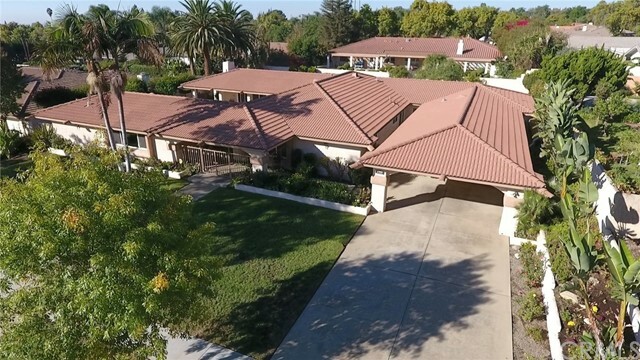 5 Full Bedrooms all with unique en-suite bathrooms, Office, Meditation Room, Game Room, State-of-the-Art Movie Theatre, Wine Cellar, enormous kitchen pantry, four indoor fireplaces and two outside, and outdoor kitchen. No expense was spared on this custom smart home offering full automation of all amenities including interior / exterior lighting, indoor / outdoor audio, fireplaces, AC /Heating, security, and much more, all from touch screen devices strategically placed throughout the home and with remote access via a mobile app. Entertaining amenities include a salt water infinity edge spa, rock-water slide into the large pool with its several water features, multiple outdoor fireplaces, outdoor kitchen and televisions, driving range & private putting green. Park up to 5 vehicles each in their own private garage bay, and there is ample guest parking as well as space for RV and/ or boat parking." "Exquisite custom home. Built in 2014. Shows like a model home. Sits on almost an acre, high in the hills of San Antonio Heights behind the gates in the exclusive neighborhood of holly hills estates. Views of city lights and as far as Catalina Island. 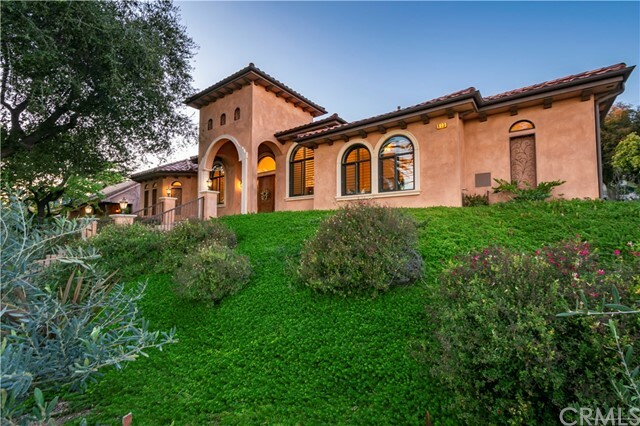 This Mediterranean masterpiece boasts nearly 7300 sq ft with 5 bedrooms and 5.5 baths. enormous master retreat with 2 sided fireplace and sitting room. walk in master closet with granite island. huge gourmet kitchen with Top of the line Viking appliances and granite counter tops. 10 ft ceilings and gorgeous Travertine and hardwood floors complimented by 8 ft solid core mahogany doors throughout entire home. features include four (4) ton ac units. 2 upstairs & 2 downstairs. 2x6 framed walls with r19 insulation. 4 car garage and motor-court that can accommodate another 10 vehicles. built in ceiling speakers inside and out. It is permissible to add a Casita or living quarters on this property because of its size. This is a smart home. lights, security system and ac units can be controlled from any phone. Magnificent views for building your own infinity pool." "Luxury awaits the new owner of the most iconic Upland home perched high above the city offering panoramic views of the inland empire and beyond. This exquisite estate was custom built with every architectural detail focused on the view below. Accessible from not one, but two automated gates within the exclusive Holly Hills Community and with a private road identifiable from miles away. 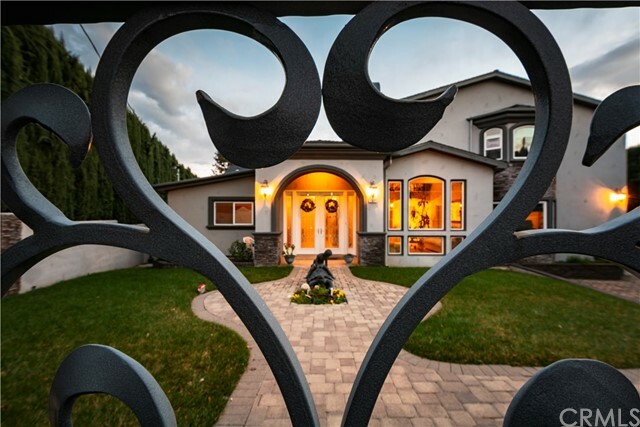 This highly sought after home will impress the most discerning buyer. Offering 6 Bedrooms each with their own en-suite bathrooms including a downstairs Master, this open floor plan flows seamlessly over 6,500 square feet of interior living space. Unimpeded views from every window, including an expansive outdoor entertainers backyard encased in glass ensuring you never miss a spectacular sunset which can be seen all the way out to Catalina Island. Spend your evenings overlooking the valley below while soaking in the 25 person infinity edge hot-tub, or enjoy the covered outdoor kitchen equip with top end appliances, surround audio equipment, and built-in overhead gas heaters. This gorgeous estate also includes a detached guest house with full bathroom, built-in bar, and bedroom. Additional amenities include a whole house fan, soft water filtration system, private motorized security gate, alarm system, fully paid off solar system and much more. Don t allow the rare opportunity to own the most prestigious home along the hills to slip through your fingers." "This traditional Italianate custom estate offers comfortable family living as well as grand scale entertaining. Nestled in the foothills of San Antonio Heights this elegant residence boasts 6 bedrooms and 7 baths (including casita). Magnificent arched entry featuring double doors of wood, glass and iron. A grand foyer opens to the music/library with a gorgeous Palladian style window, bookshelves and beamed ceilings. Elegant soft archways allow for a natural flow to the formal living room with fireplace, formal dining room and family room with beautiful coffered ceilings and fireplace. Gourmet kitchen with rich cabinetry, granite counters, large island, wolf range, sub-zero refrigerator/freezer and butler s pantry, At the heart of the home is the central courtyard with fireplace open to the living spaces. A guest bedroom, oversized laundry with built-in work station and 4 car garage complete the lower level. Upstairs is the perfectly planned entertainment area with billiard room and private theatre. A grand hallway leads to the master suite, complete with a romantic fireplace and large arched windows with private balcony, The master bath features double sinks, make-up vanity, large walk-in shower, sunken spa tub plus two large walk-in closets. 3 spacious secondary bedrooms with en-suite baths complete the second level. The grandeur continues outdoors with a luxurious pool, spa and attached casita perfect respite for guests or in-laws with separate entryway and garage." "EXQUISITE Estate in prestigious San Antonio Heights! Privacy & spectacular views of mountains & city lights! Top quality initial construction w/upgrades throughout, completely remodeled in 2013 w/constant upgrades. A home for comfortable enjoyment & lavish entertaining. INTERIOR FEATURES: 10+ft ceilings, top-tier chandeliers, Brazilian Cherrywood floors, plantation shutters, custom-made Italian tile, recessed LED lighting, Oak cabinetry, crown moulding, high-end ceiling fans, stone and marble fireplaces, instant hot water, water softener, spacious office w/custom built-in bookshelves/cabinets/desks, French doors w/custom screens, wine nook, gourmet kitchen w/black marble countertop, Jenn-Air appliances, 6 top-tier exhaust fans, center island w/sink, walk-in pantry, dining area, family room w/built-in cabinets, laundry room w/sink/cabinets/tiled counter, spacious master suite w/retreat area, his & her walk-in closets w/custom-built storage, Bidet toilets, spacious shower, spa tub. SECURITY FEATURES: coded iron entry gate, alarm system, smart security lantern, video cameras, outdoor sensor lights, intercom. EXTERIOR FEATURES: Custom ironwork, beautiful, spacious, private back & front yards, lushly landscaped including fruit trees, 3 covered patio areas, built-in BBQ station, oversized pool/spa, playhouse, oversized chess set, show stage w/lights/gas, garden w/fountain. This DREAM estate must be seen to be appreciated in all its BEAUTY & GRANDEUR! BE PREPARED TO FALL IN LOVE!" 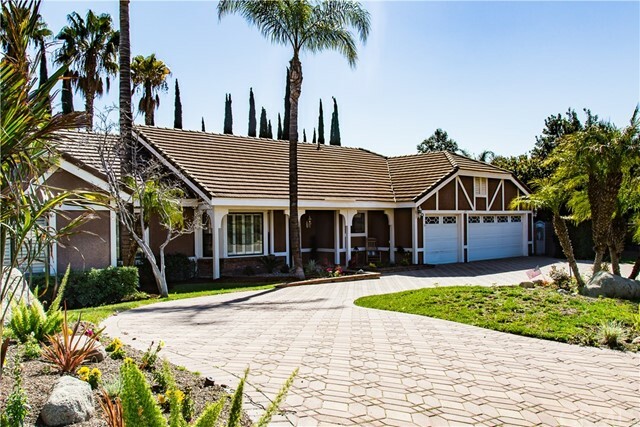 "Awesome single story home in the prestigious neighborhood of North Upland. Boasting 5 bedrooms and 6 bathrooms with over 5,500 sqft in living space including a separate pool house for entertaining or guests! Rebuilt in 1997 this home features all the comforts of modern living and can be felt upon entering. Situated on an almost 1 acre flat lot, the possibilities for this property are endless. Outside BBQ and cooking area allows for food prep while entertaining. Surrounding a gorgeous pool, this home is truly something that needs to be seen to be appreciated. Close to shopping and major highways as well!" "View!View! 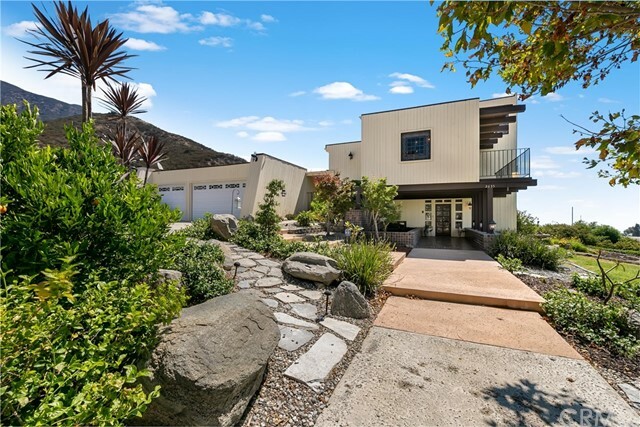 Breathtaking panoramic view of the city lights,the valleys ,and the mountains,on a clear day you can see Catalina island ,enjoy the sunrise and the sunset from the view room and relax.This is a custom home located in a prestigious and private community of Holly Hills Estates . The house features a remodeled kitchen with brand new stainless steel appliances ,upgraded bathrooms and shower,new tile floors and new carpets throughout,new paint inside and out,this unique house is multi levels and has more than 40 windows with views ,the property comes with 1/4 share of San Antonio water ,please come and see it for yourself ." "Immaculate, view estate nestled in the hills of the prestigious San Antonio Hts.Gated entry & deep flag lot provide the ultimate privacy. Quality & comfort are yours w/approx. 4,713 sqft of luxurious space, 4 oversized bedrms each w/bathrm, wine rm, billiard rm or media/bonus rm, office & 4.5 baths. Spacious 2nd master downstairs w/a bath. Elegant formal foyer w/soaring ceilings, Trey ceilings in living & dining rm, Marble flooring w/Granite inlays, solid teak wood flooring & carpeting, plenty of windows throughout for an abundance of natural light, 2 AC units, pre-wired for FiOS, wired for security & has security cameras+monitor along w/the electronic gate. Gorgeous Chefs kitchen boasts custom cherry cabinetry, Granite counter tops, large island w/a breakfast bar, GE Monogram professional grade built-in appliances: 4 burner range, griddle & grill+dble ovens & warming shelf, additional built-in refrigerator, wine fridge, dishwasher & trash compactor, nook area & butler pantry connecting to dining rm. Adjoining family rm w/a fireplace & wet bar is great for entertaining. Elegant formal living w/a fireplace. Formal dining room gives ample space to entertain on any occasion. Master suite features a fireplace & master bath w/a vanity, walk-in closet, soaking tub & separate shower. Extra-long driveway provides for possible RV/boat parking-plenty of parking space. Oversized 4 car garage. Lovely view of the mountains, valley & city lights. Low maintenance yard, lots of citrus trees." "PRICE REDUCTION!!! HERE IS YOUR CHANCE TO OWN A LIFESTYLE WORTH LIVING!!! Executive North Upland Home - Built by J.M. Peters. 4 Bedrooms + Office (Could be 5th Bedroom) + Large Bonus Room (Could be 6th Bedroom) Plus 4.5 Bathrooms (1 Bath Downstairs). You will absolutely love this home! Curb Appeal Galore, Circular Driveway, Double Door Entrance, Spiral Staircase, Formal Living Rm. w/Fireplace, Formal Dining Rm. w/French Doors to Backyard, Large Gourmet Kitchen with Center Island and Seating for 4, Breakfast Nook, Double Convection Ovens, Microwave, Dishwasher, Built-in Professional Stove/Cook-Top, all open to the Family Room w/Fireplace, Wet Bar w/Wine Refrigerator, and Sliding Door Access to the backyard. Downstairs Indoor Laundry Room w/Sink & Built-Ins. Fabulous Master Bedroom/Retreat with Fireplace. Master Bathroom features Double Sinks, Double Walk In Closets, Separate Soaking Tub, Separate Shower. Luxurious Backyard Getaway features Salt Water Pool & Spa, Remote Controlled Lighting, Music, Speakers, and Pool Functions, Covered Patio, Built In BBQ Island, Gas Fire Pit. 3 Car Garage Plus RV Parking Access. Large Grassy Area, Fruit Trees. Gorgeous Backyard Design for your Enjoyment! No Mello Roos. No HOA. Pride of Ownership! A Must See!" "Luxurious custom built estate nestled in the San Antonio Heights Community. Built in 2017, this Mediterranean single story masterpiece features 4 bedrooms, 3 bathrooms and 3,500 sqft of living space. Enter the home with a wow into the grand foyer adjoined by the library/study equipped with built-in cabinets and shelving. Walk further into an elegant dining room to soak in the priceless views of the valley and city lights. Step a couple of feet over into the formal living room and enjoy a cozy cool night next to the fireplace. Beautiful hardwood flooring has been matched with custom pecan plantation shutters throughout this estate. Overlooking the spacious family room, the gourmet kitchen offers a large center island, granite countertops, stainless steel appliances, and a walk-in pantry. The master suite is privately located on the west side of the house and includes a fireplace and dual walk-in closets which is complemented by a spacious master bathroom featuring separate vanities, walk-in shower, and large bathtub. The east wing of the home includes the 3 additional bedrooms, 2 beautiful bathrooms, and the large laundry room. In the backyard, you will find plenty of space for entertaining guests and enjoying the mountain views. The homeowners have meticulously landscaped front and backyards to include many fruit trees such as oranges, tangelos, grapefruit, and plums. This home also has RV parking at the rear of the property. Best Single Story in Upland Change my mind!" 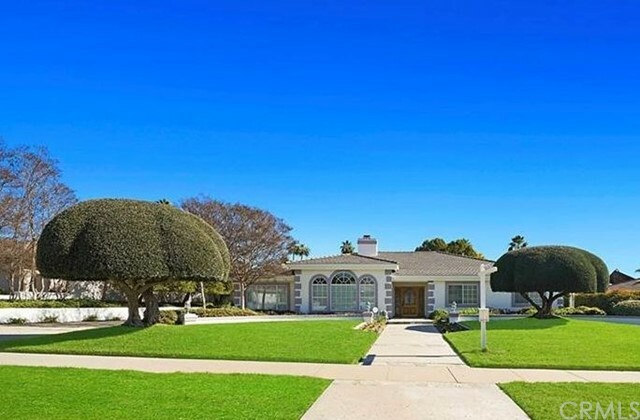 "Welcome home to one of Upland's most amazing Estates. This stunning home is perfect for entertaining, spectacular enough to host from a luxury wedding to a private family birthday party. The double doors greet you to an elegant foyer. Home has soaring high ceilings. Formal living room opens to the homes formal dining room. Beautiful glass sliding doors open to your serene patio. Beautiful gourmet kitchen with granite counter tops, boasts walk in pantry and island. Large family room with fireplace and wet bar. Main floor bedroom with its own private bathroom in suite. Laundry room with with sink. Upgraded gorgeous hardwood flooring, elegant crown molding. Spacious, over sized Grand Master suite with retreat sitting area, cozy fireplace, dual walk in closets, dual sinks, luxurious soaking tub with separate shower. Large bonus/loft room upstairs, perfect or playroom, family room, or etc bedroom. Plantation shutters. Private swimming pool, spa & pool house. Beautiful landscaped yard, covered patio with outdoor fireplace, BBQ area. RV parking area, bring your boat and all your toys. Casita is approx. 400 square feet and is the perfect addition to this already amazing family home." "Elegant single level home, located on one of N. Uplands most desirable streets! This 4,353 sq ft beauty, boasts dramatic vaulted ceilings, and a grand formal entry. The large, impressive step down living room, with brick fire place, formal dining room, chefs kitchen with adjoining breakfast room, and family room with built in book cases, create an inviting living space. Five spacious bedrooms and four full baths, Including the private master suite, with dressing area, dual sink vanity, and separate soaking tub, as well as a library with herringbone wood flooring and warm fireplace, an oversized billiards room with full bar, and a spacious wine cellar, make this home perfect for both comfort and socializing. Lushly landscaped yards, totaling nearly 1/2 acre, are ideal for large parties or quiet relaxation, complete with gas hook up for b-b-q, covered patio and a sparkling pool and spa. Other features include the indoor laundry room, 3 car attached garage, with wall to wall built-in storage cabinets and work bench, and an enormous over-attic storage space with pull down ladder. This wonderful property is an absolute must see!" 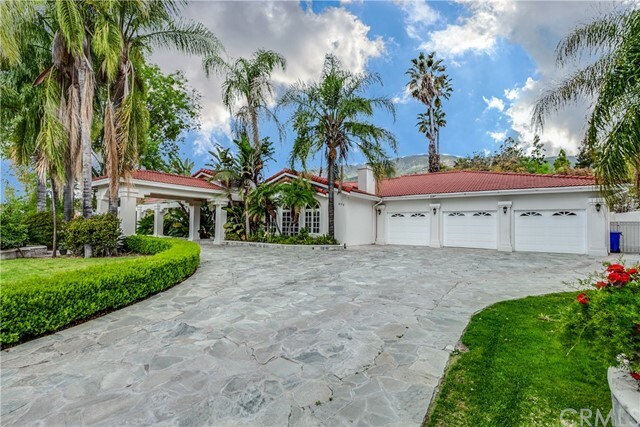 "Exceptional Single Story Estate located in one of the most sought out areas of Upland.Home boasting architectural lines and designer finishes. Guests are greeted by a double door entry, complete with Marble entryway.Classic open layout flowing from the spacious living room that encompasses High ceilings and Double Drop arch wave texture Glass windows. Custom Glass Niches on both sides of the Marble fireplace lead you into the elegant dining area/ custom Wallpaper. Ceilings are Textured and just a gorgeous and stunning feature of this home.Formal dining room is perfect to host the most elegant dinner parties all year long.Family room you will notice the Vaulted ceilings, Stone fireplace complete with 2- double cabinets with glass. Study /Library Built-ins and desk area.Kitchen offers Granite Countertops. Features induction cooktop, Lazy susan, All cabinets are baked off white w/Paneled glass doors. Master suite features a walk-in closet w/full built-ins & built-in Safe area.Master Retreat is complete with spa-like bathroom w/dual vanity, two glass windows above mirrors, Jacuzzi Tub, enclosed shower with glass circular block.Bedrooms are great size with floor to ceiling mirrors and plenty of space.Great Mothers quarters with private Bathroom in the back of the property. Private double doors that lead to the outside courtyard Water fountain.Game room is located at the back of the home this is a perfect set up.Lush, Large flat usable land with Gazebo,Bbq area complete this home!" "Nick Gula Original home he built for himself! 2 separate entrances perfect for multi-family living. Live in one lease the other. Giant yard with another private yard as well. BEAUTIFUL custom built pool for deep sea diving practice! Newer tile roof, California Mission style wood beamed ceilings with huge corridors with mission flair accentuate the impressive window space allowing for natural sunlight in almost every room! Media theater room, mother in laws Qtrs maid & nanny apartment! Private back yard for 2ND MASTER SUITE for absolute privacy! Every attention to detail with water wise irrigation. Generous walk in closets with spa tubs, incredible new hard wood flooring! Entertain quests with outdoor dining! Perfect home for lavish entertaining with outdoor courtyard with fountain! Sit out by the pool and relax and enjoy the gorgeous mountain views! Just minutes from Mt. Baldy. Feng Shui elements of happiness, health Walk to schools and easy access to the 210, 10 and 60 fwys. Just a short 10 minute trip to the train stain and metro link! Incredible privacy with an easy blowing cross breeze through out. Nick built this home for himself. Come on over and stay awhile & see the expansive marble flooring, custom built in bar, up-dated kitchen and baths, guest rooms and or lots of extra room to retreat. Experience the back yard spa/retreat atmosphere as you relax out by the pool with a good book or watch the humming birds and butterflies! Truly a MASTERPIECE & VERY VERY QUIET!" "Prime North Upland location home warms the heart at every turn. Beautiful Single story layout w/approx. 2668 Sq Feet. features 5 bedrooms, 3 bathroom, 2 fireplace, formal living and dining rooms. Inviting kitchen w/granite counters, recessed lighting, 5 burner stove top, built in microwave, refrigerator, wine cooler, double oven, dishwasher, and open breakfast area. Separate interior laundry room and attached 3 car garage complete the main home. GUEST HOME created approx.620 SF in additional finished living space, features living room,1 bedroom, kitchen, 3/4 bath, FA/AC, w/covered porch and Private Driveway; room for an RV, Toy Hauler or Extra Guest Parking. Highly Desired Setup, for your granny, nanny or next generation living! * Wrought iron fencing for the patio deck area with Pool/Spa and gas Fire pit. Additional patio entertaining area with a custom counter & BBQ. *Property lot is approx. 21,800 SF. Mature landscaping, fruit trees, garden walls, Too many features to list. Please call for more details." 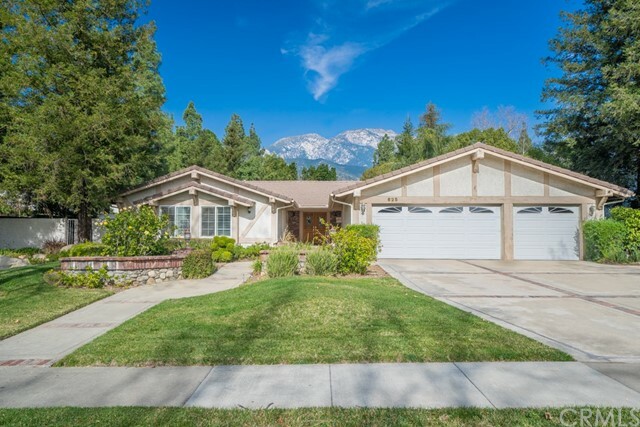 "Enjoy breathtaking views of snow-capped mountains from the front porch of this desirable San Antonio Heights single story home. Enter into a large open formal living and dining room. Through an archway into a casual family room with an inviting fireplace adjoins the kitchen which features white cabinets, corian countertops, gas stove-top, stainless steel appliances and a large garden window looking out onto a wonderful gazebo and a variety of fruit trees. One side of the home features three large bedrooms and full bathroom, the other side has a large master suite with sliding glass doors opening to a covered patio next to the pool/hot tub. The suite offers a separate room for an office, den or gym with French doors opening to the back patio. The master bath has a large soaking tub and shower, toilet room, makeup vanity and dual sinks. An amazing great room, vaulted ceilings and large windows give you views on three side of the beautiful backyard with some wonderful landscaping. Two sets of sliders welcome you indoor-outdoor living complete with a versatile he or she shed. Find a third bathroom across from a full laundry room leading to a 3 car garage with overhead storage. Shutters throughout, solar panels and dual HVAC making this home more energy efficient as it is charming." "INVESTORS WELCOME!!! !Location, Location, Location. Beautiful Custom Built home 3592 square feet with lots of originality and charm in the Prestigious neighborhood of San Antonio Heights that was re-built in 1983. GUEST HOUSE is additional 675 square feet another amenity of this beautiful custom home.Detached guest house has a 3/4 bathroom perfect for your guests, in laws or additional income possibility. Court Yard entrance with covered bricks walkway invites you in to a spacious formal living and dining room with hardwood flooring that is open to the kitchen with granite counter-tops and stain steel appliances overlooking the family room with high beamed ceilings overlooking the pool area through the double french doors from one side and the the backyard on the side side with matured landscaping. More to this beautiful home is two bedrooms and full bathroom downstairs. Upstairs is master bedroom with a balcony overlooking the backyard and the city lights .Spacious master bath with a huge walk in closet and another bedroom and a full bathroom is more to the upstairs. Hardwood floors continue throughout the house . Minutes away from the 210 freeway . Very Close to shopping and amenities. This is a MUST SEE." "WELCOME TO THIS STUNNING, WELL CARED FOR HOME, PERFECT FOR EVERYDAY LIVING, & ENTERTAINING!LOCATED IN A VERY DESIRABLE AREA OF NORTH UPLAND, ON A CUL DE SAC.ENTER THROUGH THE LEADED GLASS, DOUBLE ENTRY DOORS TO THE FORMAL ENTRY WITH SOARING EXPOSED BEAM CEILINGS.THE SPACIOUS FAMILY ROOM IS LIGHT & BRIGHT ROOM WITH STAINED GLASS WINDOWS, FRENCH DOORS, TOASTY FIREPLACE, A TWO SIDED WALK IN BAR W/A SINK & HANDY WALK IN STORAGE CLOSET, SERVICING THE FAMILY ROOM & THE DINING ROOM. THE DINING ROOM & LIVING ROOM ALSO HAVE FRENCH DOORS TO THE BACKYARD, STAINED GLASS WINDOWS, HAND SCRAPED ENGINEERED WOOD FLOORING & A FIREPLACE IN THE LIVING ROOM.THE KITCHEN HAS MANY WINDOWS TO VIEW THE BEAUTIFUL BACKYARD, WALK IN PANTRY, GRANITE COUNTERS, STAINLESS SINK, RECESSED LIGHTING, CENTER ISLAND & HAS BEEN UPDATED W/ NEWER APPLIANCES. THE 5TH BEDROOM IS CURRENTLY BEING USED AS AN OFFICE WITHOUT A CLOSET.THE MASTER BEDROOM HAS A FIREPLACE &, MANY WINDOWS, YET VERY PRIVATE, TWO SIDED CLOSET ACCESSED FROM THE BEDROOM & BATHROOM, & ANOTHER LARGE WALK IN CLOSET. THE MASTER BATHROOM HAS BEEN UPDATED W/ A SOAKER BATHTUB, TWO GRANITE COUNTER VANITIES, MIRRORS, & REMODELED SHOWER. THE OTHER TWO BATHROOMS HAVE BEEN UPDATED WITH CAN LIGHTS, GRANITE & SHOWER DOORS.THE BACKYARD IS A PRIVATE PARADISE ACCESSED THROUGH 3 SEPARATE FRENCH DOORS, BRICK LINED CEMENT PATIOS, UPDATED PATIO COVERS, & PLANTERS, RETAINING WALLS, EXTERIOR LIGHTING THAT ENHANCES THE NATURAL BEAUTY OF THE LANDSCAPING." 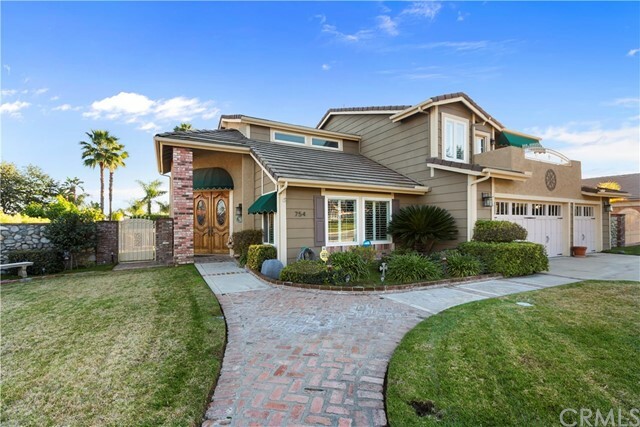 "Gorgeous home situated on the prime corner lot of Leggio Lane. Minutes from shopping, entertainment, and restaurants. Enjoy stunning mountain views from the spacious balcony and create everlasting memories. The home includes an abundance of upgrades throughout the house. The installed solar panels will reduce your electrical bill for those warm summer days. You'll love the newly installed laminate flooring throughout the home. The pristinely kept 6 bedrooms and 4 bath home are sure to deliver a perfect match for entertainers. The spacious open floor plan style kitchen and living room area are separated by a gorgeous large granite topped island, ready for you and your family get-togethers. Step out into the backyard and continue the festivities, it's recently been professionally landscaped. One bedroom and a bathroom are downstairs. Travel up the well finished curved staircase and you'll find the 5 additional bedrooms with two Jack and Jill bathrooms. The master bedroom has a private bathroom with a shower and a roman tub. Throughout the home, you'll find recessed lighting that is truly tasteful. 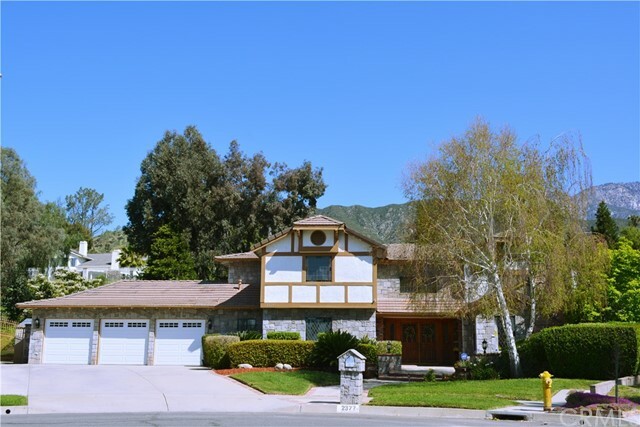 The home is in a prime Upland location and literally minutes from the 210 freeway. Come view today." "Situated on an over 1/3 acre corner lot, in a neighborhood of well kept upscale homes is this 5 bed 3 bath dream home (1 bed downstairs w/ direct access to 3/4 bath). Perfect for large scale entertaining w/ a grand entrance featuring gorgeous wood trimmed staircase, formal living & dining rooms, super large kitchen with secondary dining area, quartz counters, peninsula counter-top, and tons of storage/cabinets, wet-bar and HUMONGOUS family/game/great room featuring massive full wall brick fireplace and custom built-ins. Covered rear patio leads to in ground pool and spa. Mature landscaping w/ many fruit trees and all auto irrigation. Upstairs large master suite has private balcony with awesome mountain views and upgraded granite dual basin vanity in en-suite bath, also a large walk in closet. 3 more large bedrooms located upstairs, one with private balcony. Dual entrance brick lined driveway (from both 17th St. and Palm Ave.) offers plenty of off-street parking as well as attached 3 car garage (3 auto openers) and possible room for RV parking. Home shows that it was always very well taken care of and has had many recent upgrades. Truly a dream home and dream neighborhood worth aspiring to. 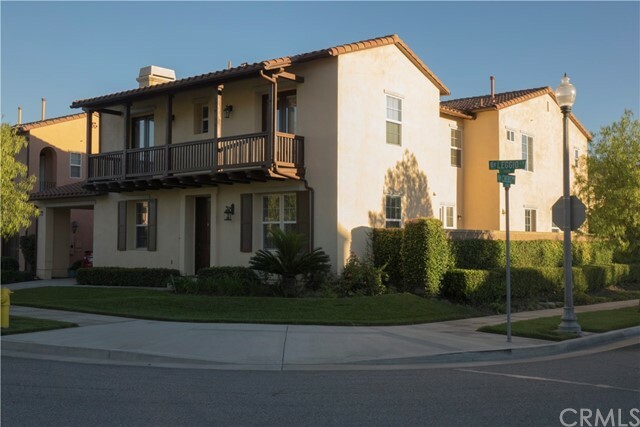 North Upland location is close to schools, shopping and gorgeous Euclid Ave. Ye Bridle Path"
"Fabulous North Upland Home located within the Master Planned Community of The Colonies. Built by Centex Homes - Ellington Development, This Beauty Features 5 Bedrooms (1 currently being used as a loft), 4 Bathrooms, Formal Dining Room, Family Room with Fireplace Opens to Spacious Kitchen, Island, Granite, etc...which opens to a Separate Breakfast Room with Slider to the Backyard, Downstairs Laundry Room w/Sink, Built Ins, & Closet. 1 Bedroom, 1 Bathroom Downstairs. On the Second Level, There are 2 Large Bedrooms w/their own private bathrooms, Open Loft with Hardwood Floors, Huge Master Suite/Retreat with Double Walk-In Closets, Mirrored Doors, Double Sinks, Separate Soaking Tub, Separate Oversized Shower. Upgraded and Turnkey!!! Custom Upgraded Cabinets Throughout, Custom Wrought Iron/Wood Staircase, Plantation Shutters, Hunter Douglas Roman Shades, Custom Crown Moldings & Custom Baseboards Throughout Home, Custom Interior Paint, Travertine Floors, Stainless Steel Appliances, Newer Faucets for Kitchen and Laundry Room, Double Ovens, Drawer Pulls Outs, Custom Built-In Bookcase in Family Room, Custom Dining Room Chandeliers & Matching Pendant Lighting Over Island, & Custom Awnings. The Backyard is Lush, Spacious, & Private. Enjoy your Evenings Entertaining on your Private BBQ. 3 Car Attached Tandem Garage with Interior Paint and Cabinets for Storage. Custom Wrought Iron Gates on North Side Functions as a Dog Run as well. Added Bonus, Upstairs, Enjoy Your Private Balcony!" "Stunning pool home in North Upland, pride of ownership inside and out! This home has so much to offer, hardwood flooring, crown molding, wainscoting, plantation shutters, custom dual pane windows diamond edging and crank out. The upgraded kitchen with large center island and stainless steel appliances, open to large family room with cozy brick corner fireplace. Sliding door opens to impressive fully covered patio with high ceilings, with ceiling fans and lots of lighting, plus overlooking the beautiful fenced pool and spa area. There are lots of space for everyone to enjoy in this gorgeous fully landscaped yard. In addition you have the possibility for RV parking. Formal Dining Room, large living room with vaulted ceiling. Upstairs, Three nice size bedrooms and a double door entrance to large Master Suite with vaulted ceiling, window bench, French door to balcony with lovely mountain views, also City views from other bedrooms. Master Bath with dual sinks and separate tub and shower and also a nice size walk-in closet." "This gorgeous property is located on a quiet tree-lined street in North Upland & is absolutely stunning! You will be impressed by the gorgeous curb appeal this home offers from the moment you pull up to the house. Enter to find high ceilings & lots of windows that let in an abundance of natural light. The open & sprawling floor plan is perfect for entertaining. A beautifully remodeled kitchen with custom cabinets and granite counters is ideal for the aspiring chef! The kitchen opens to the spacious family room, creating a great room effect. Built-in 7.1 surround sound in Family Room. Additionally, travel upstairs to find very generously sized bedrooms as well as fully updated & renovated baths all with quality appointments. The master suite is very spacious & offers a soaking tub and walk-in closet, perfect to relax after a hard day. There is also a bonus seating area or office. Again, exceptional appointments abound. The master closet is a dream come true! Very spacious & thoughtfully organized to handle all of your special items including bags and shoes! Exit outdoors to find your own private paradise! Cool off on hot summer days in your very own Custom Rock pool with Waterfall & spa. Additionally a custom BBQ area with built-in refrigerator and Grill. There is also a covered patio & lush landscaping that is beautifully manicured & keeps the yard totally private. Don't forget the 3 car carpeted garage!" "Live behind the gates in this custom home nestled in the heart of San Antonio Heights. This enclave is rebuilt as of 2005 and contains a large 2,800 square feet. 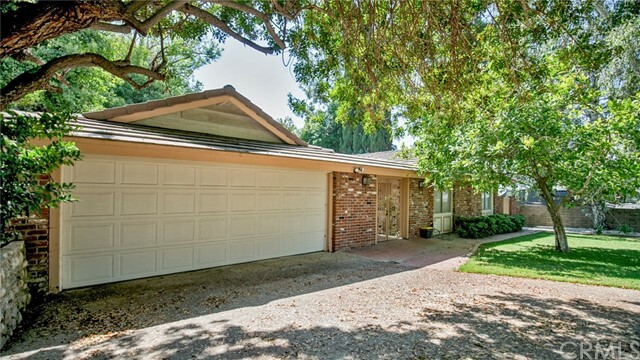 The 900 sqft guest home is located directly above the car enthusiast, over-sized garage. Feug-Shui friendly, the home faces north toward the mountains providing a breathtaking view. Your experience begins as you enter through the custom wrought iron gates lining the entire front the the property. The front walkway leads you to the stunning 8ft double door entry. Vaulted ceilings, custom wrought iron stair case, smooth finished walls and bull-nose edges are all details you will notice that give this home a luxurious look and feel. The 1st floor provides 3 beds, 2 baths, a formal living room w/ fireplace, a dining room, den and a chefs dream kitchen. A 48 inch Wolf stove, custom hood, pot filler, Sub-Zero fridge, wine fridge and rack, pot and pan drawers, utility sink and huge pantry are all features any cook would appreciate. The entire 2nd floor furnishes the master retreat which includes a dual sided fireplace, wet bar, Jacuzzi tub with breathtaking views and huge walk in closet. The 900 sqft studio has a full bathroom, w&d, is plumbed for a kitchen and provides endless possibilities for your use. Copper plumbing, zoned heat and air, climate controlled garage, pavered driveway and lots of storage. Also included is a .25 share of water stock currently valued at $18k. Welcome home.."